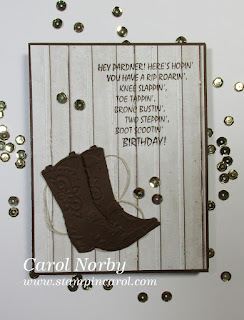 Today is our grandson-in-law's birthday and, since he is a cowboy through and through, I wanted to make him an appropriate card. The sentiment stamp I've had for ages. It originally was on a wood block but I unmounted it, remounted it on red rubber and added some Alene's Tack It Over and Over on the back and promptly forgot who made it. Since it's not indexed on the back its very difficult to get it even where I want it. You can see it's a bit off kilter. 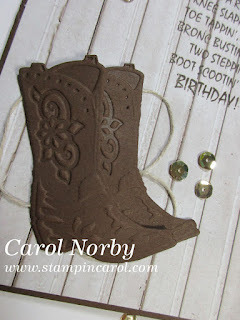 I have a fun die called Cowgirl Stomp from Spellbinders that I like (and is no longer available) and yes, I know it has a flower on each boot but I'm hopin' Sky doesn't look that close. I used a retired print paper from FSJ as I love the wood look. I looped some Natural Twine behind the boot and added some Gold Friendship Sequins for a bit of bling. I used Hazelnut Blend card stock for the base and the boots and Hazelnut Blend ink for the sentiment. I'm sorry that I don't have picture links as yesterday afternoon as I was putting this post together my ShareASale page wasn't working. I also used the Easy Glide Runner, Foam Squares med., Glue Dots, Details Pro Shears, and the Platinum 6 machine. Do you try to make cards or projects that go with the recipient?